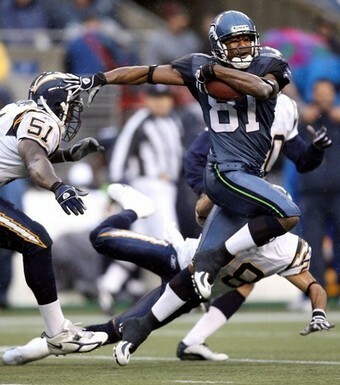 Nobody has a more unproven batch of WRs than the Seahawks…and yes, even my very own Chicago Bears. The “Pamela Anderson to USA Female Swimmers”-huge difference between Seattle & Chicago, Mr. Holmgren actually has a gunslinger under center. While everybody drools over the big dogs in Indy, NE, & Jerry Jones land, Hasselbeck quietly ranked 4th in attempts last season, and under the former Favre-headmaster, always seems to rank in the top 8 in TDs, total yards, and fantasy points for QBs. She's so happy, she must have Nate on her Fantasy squad! As for the 26-year old speed demon Nate Burleson, he ranked 1st in TDs & 2nd rec. yards for the Seahawks last season with Bobby Engram, Deion Branch, & D.J. Hackett in the mix. This year, Hackett’s in Carolina, Branch is still recovering from a torn ACL in last year’s playoff loss, and leading receiver Bobby “how the hell did he catch 94 balls last year” Engram is out eight weeks with a cracked shoulder. Unless you’re Marty Booker-slow, I’m guessing you catch my drift with baldy’s options when he drops back…it’s like picking a hottie at a Green Bay bar with a guest appearance by an Olsen Twin and your holding a diet pill and bottle of Grey Goose. I know the former Nevada-star can be a little spacey at times, but seriously, how does he not greatly eclipse the 50-catch and 9 tuddies from last season. Even though Seneca was robbed of a Heisman, unlike NEB's Eric Crouch he can actually play QB at the highest level! And speaking of the Seahawks, Lovie Smith and his two-headed handicapped QB-monster head to Seattle Saturday for a preseason blood-bath…ok, maybe not that, but considering Vegas has a line, in my mind there’s no difference between this and the Super Bowl. 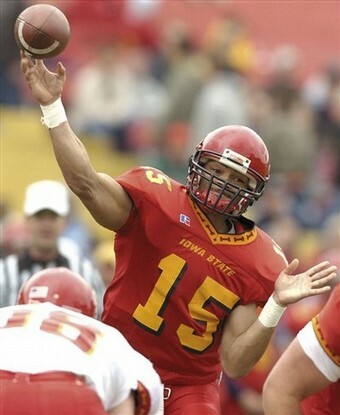 Not to mention, my favorite footballer of all-time, Seneca MFin Wallace will be taking a ton of snaps with Hasselbeck’s stiff back. While some will never like the unique flair of Seneca are a chick with an arm tat, I think you're missing out! You laugh, but the former Cyclone was AURORA SNOW in Naughty Bottoms-flawless in Minny last week (15-20 and 3 TDs), not to mention QB Charlie Frye will be splittin' time with the superstar, and I’d rather have the former Brown throwin' to our cast of garbage in Chicago. Especially, with the Bears awful OL tryin' to mesh in possibly the loudest NFL stadium, I believe the Seahawks easily cover the -1. With that resolved, let's hit-up my ATS Play of the Day! Just like this orange suit, I don't think Fenway can contain the bats on both sides of the plate tonight! ...winnings to buy my girl some real Leopard Skin! This page contains a single article from August 15, 2008 11:24 AM. The previous days article was ATS Diamond Notes & Hot Olympians. The next days article was PAC-10, SEC FOOTBALL & MLB ATS PICKS.